Spirochaeta africana Zhilina et al. 1996 is an anaerobic, aerotolerant, spiral-shaped bacterium that is motile via periplasmic flagella. The type strain of the species, Z-7692T, was isolated in 1993 or earlier from a bacterial bloom in the brine under the trona layer in a shallow lagoon of the alkaline equatorial Lake Magadi in Kenya. Here we describe the features of this organism, together with the complete genome sequence, and annotation. Considering the pending reclassification of S. caldaria to the genus Treponema, S. africana is only the second ‘true’ member of the genus Spirochaeta with a genome-sequenced type strain to be published. 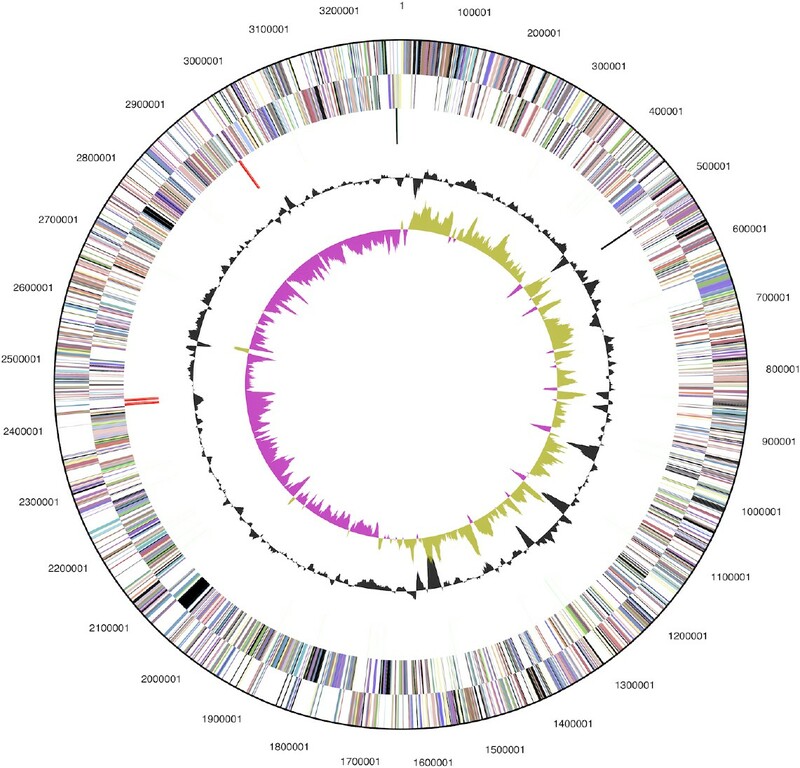 The 3,285,855 bp long genome of strain Z-7692T with its 2,817 protein-coding and 57 RNA genes is a part of the Genomic Encyclopedia of Bacteria and Archaea project. Strain Z-7692T (= DSM 8902 = ATCC 700263) is the type strain of the species Spirochaeta africana . The genus Spirochaeta currently consists of 18 validly named species . The genus name was derived from the latinized Greek words ‘speira’ meaning ‘a coil’ and ‘chaitê’ meaning ‘hair’, yielding the Neo-Latin word ‘Spirochaeta’, a ‘coiled hair’ . The species epithet was derived from the Latin word ‘africana’, of African continent, found in the African alkaline Lake Magadi . Here we present a summary classification and a set of features for S. africana strain Z-7692T, together with the description of the complete genome sequencing and annotation. A representative genomic 16S rRNA sequence of strain Z-7692T was compared using NCBI BLAST [3,4] under default settings (e.g., considering only the high-scoring segment pairs (HSPs) from the best 250 hits) with the most recent release of the Greengenes database  and the relative frequencies of taxa and keywords (reduced to their stem ) were determined, weighted by BLAST scores. The most frequently occurring genera were Spirochaeta (91.1%), Treponema (5.8%) and Cytophaga (3.1%) (29 hits in total). Regarding the two hits to sequences from members of the species, the average identity within HSPs was 99.6%, whereas the average coverage by HSPs was 99.0%. Regarding the 19 hits to sequences from other members of the genus, the average identity within HSPs was 89.1%, whereas the average coverage by HSPs was 78.9%. Among all other species, the one yielding the highest score was Spirochaeta asiatica (NR_026300), which corresponded to an identity of 96.6% and an HSP coverage of 98.8%. (Note that the Greengenes database uses the INSDC (= EMBL/NCBI/DDBJ) annotation, which is not an authoritative source for nomenclature or classification.) The highest-scoring environmental sequence was AF454308 (Greengenes short name ‘spirochete clone ML320J-13’), which showed an identity of 90.6% and an HSP coverage of 99.3%. The most frequently occurring keywords within the labels of all environmental samples which yielded hits were ‘microbi’ (10.5%), ‘mat’ (8.8%), ‘hypersalin’ (6.3%), ‘new’ (4.2%) and ‘world’ (4.1%) (221 hits in total). Environmental samples which yielded hits of a higher score than the highest scoring species were not found, indicating that this species is rarely found in environmental sequencing. 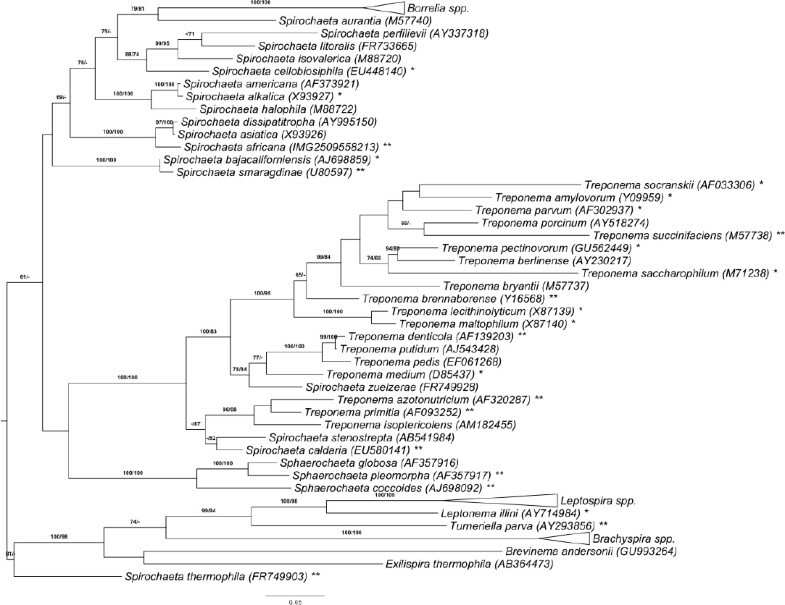 Phylogenetic tree highlighting the position of S. africana relative to the type strains of the other species within the phylum ‘Spirochaetes’. The tree was inferred from 1,332 aligned characters [7,8] of the 16S rRNA gene sequence under the maximum likelihood (ML) criterion . Rooting was done initially using the midpoint method  and then checked for its agreement with the current classification (Table 1). The branches are scaled in terms of the expected number of substitutions per site. Numbers adjacent to the branches are support values from 350 ML bootstrap replicates  (left) and from 1,000 maximum-parsimony bootstrap replicates  (right) if larger than 60%. Lineages with type strain genome sequencing projects registered in GOLD  are labeled with one asterisk, those also listed as ‘Complete and Published’ with two asterisks (see [14–20] and CP003155 for Sphaerochaeta pleomorpha, CP002903 for Spirochaeta thermophila, CP002696 for Treponema brennaborense, CP001841 for T. azotonutricium and CP001843 for T. primitia. Note: Spirochaeta caldaria, S. stenostrepta and S. zuelzerae were effectively renamed to T. caldaria, T. stenostrepta and T. zuelzerae in , however, the names have not yet been validily published. Cells of strain Z-7692T are 0.25 to 0.3 µm in diameter and 15 to 30 µm (occasionally 7 to 40 µm) in length and form regular, stable primary coils  (Figure 2); spherical bodies were seen in stationary-phase cultures (not visible in Figure 2). 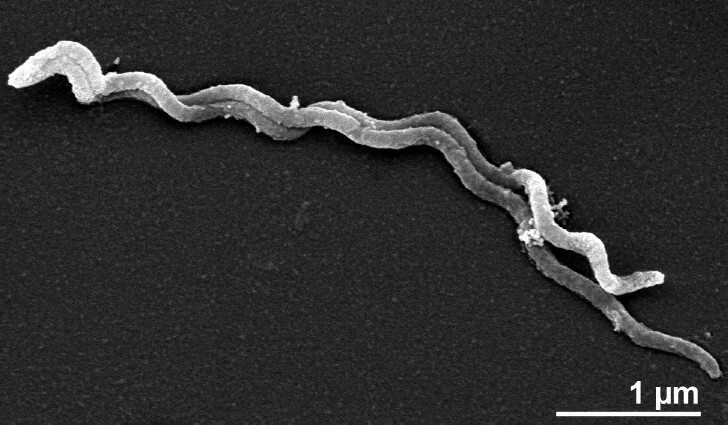 The cells are motile by periplasmic flagella  (not visible in Figure 2). The cell mass is orange . S. africana is a Gram-negative, anaerobic, aerotolerant, mesophilic microorganism (Table 1) with an optimal growth temperature between 30°C and 37°C, and no growth observed above 47°C . The optimum pH is 8.8–9.8, no growth is observed at pH 8 or pH 10.8 . S. africana is halophilic and does not grows at NaCl concentrations below 3% or above 10% (wt/vol) . S. africana strain Z-7692T, DSM 8902, was grown anaerobically in DSMZ medium 700 (Alkaliphilic Spirochaea medium)  at 37°C. DNA was isolated from 0.5–1 g of cell paste using MasterPure Gram-positive DNA purification kit (Epicentre MGP04100) following the standard protocol as recommended by the manufacturer with modification st/LALM for cell lysis as described in Wu et al. 2009 . DNA is available through the DNA Bank Network . We would like to gratefully acknowledge the help of Helga Pomrenke for growing S. africana cultures and Evelyne-Marie Brambilla for DNA extraction and quality control (both at DSMZ). This work was performed under the auspices of the US Department of Energy’ s Office of Science, Biological and Environmental Research Program, and by the University of California, Lawrence Berkeley National Laboratory under contract No. DE-AC02-05CH11231, Lawrence Livermore National Laboratory under Contract No. DE-AC52-07NA27344, and Los Alamos National Laboratory under contract No. DE-AC02-06NA25396, UT-Battelle and Oak Ridge National Laboratory under contract DE-AC05-00OR22725, as well as German Research Foundation (DFG) INST 599/1-2. BAuA. 2010, Classification of bacteria and archaea in risk groups. http://www.baua.de TRBA 466, p. 206. The Phred/Phrap/Consed software package. http://www.phrap.com.